winzrella - About me | Just dream on! My real name is Miia Tilli and I'm Finnish (and a girl, if anyone doupts that). Finland is a country in Northern Europe. For example Muumi (or Moomin) and Nokia come from this land. I were born on year 1985 during December. I have been drawing for my whole life and at some point I started to create a lot of different kind of stories. However my first serious story was "Legenda Maahishaltiasta" which I first began writing in 1999. It has changed many times on the way. This story was from the start planned to be a book. I also dreamed of publishing it, but now days that's not my intention anymore. Now it's only a story I make for readers online. My first serious comic was "Tari Uyest'" (or "the Way of Dreams"). It was first created in year 2002 and has since changed and been restarted couple of times. It's been online since 2009. Currently my main work is "Taint of Exile" which was created in year 2004 and was first brought online during the same year. That story and comic is mainly for me to learn. "Ikuiset Nuoret" is a story of which I cannot take all the credit to myself. Part of it belongs to my sister and her friend. However I created the comic on my own. I don't put much of effort in it, because my reasons for doing it are different from those with the other stories. 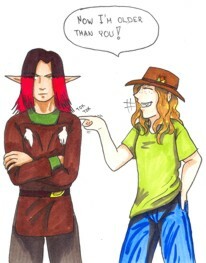 Beside these stories I draw other things and have other stories and take part in online rpg's. I also read a lot of comics and some books (I have never been very good at reading books even thought I love them, funny isn't it?!). My alias online has been for many years "winzrella". It used to be at one point something else, but I'm not gonna reveal that... Winzrella however is a character in the story ''Legenda Maahishaltiasta". It's her picture you see on the same page with my contact information (click on the link "winzrella" on left). I'm working on a page that will show you my progress on art trough the years. I'm trying to find some of the really old works for it so it will be interestin. Just have to hope that my mother hasn't thrown them away.... A link to that page will be found from here when it's done. However, for now you can enjoy seeing my progress from 2003 to 2009. Well... Is there something else you would like to know? 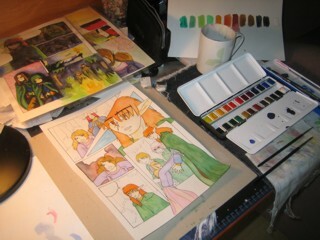 My desk while I work on a new page of Taint of Exile.